WOW! The past week (the first week of school) was just unreal! I'm sorry I haven't posted for a week. It seems like a long, long time. With the mountain of back-to-school paper work to fill out & return and my new position with the PTA, I found last week to be very overwhelming. Needless to say, I took it all one step at a time. I had a few deadlines to meet before I could let myself stamp. Anyway, I finally made my way through the clutter of papers and was able to breathe. The Silver Elastic Cord is also found in the mini catalog. I ran the Whisper White panel through the Big Shot using the Perfect Details Texturz Plate. 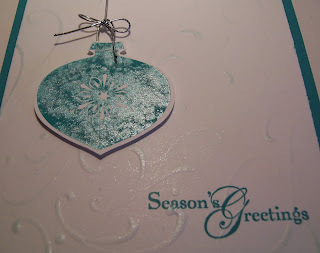 I then lightly ran the same sponge (still with the Shimmer Paint on it) over the raised texture in the card stock. This just brings the embossing out to the eye. The sentiment is from Snow Swirled. I fixed it all onto a Bermuda Bay card base. 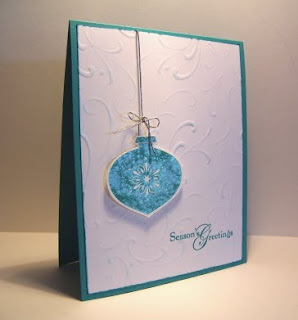 Textured Tip: Stamp your image or sentiment onto your card stock before you emboss it. That way, your stamp will have a good solid contact with your card stock. So, what do you think? Your comments are always welcome. 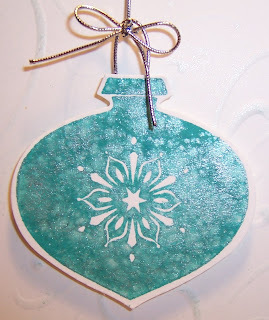 I think I will try this technique again in several different colors. I hope you are inspired to try something new today. Thanks for stopping in. This is absolutely BEAUTIFUL! Love it. If this is your first go...I can't wait to see more! Lovely!